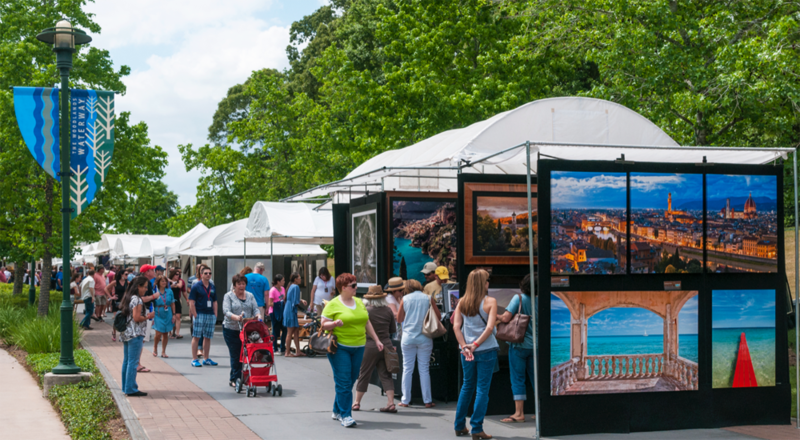 The Woodlands Waterway Arts Festival, held annually in April at Town Green Park and The Woodlands Waterway, remains our premiere event, and it provides funding for our growing community and education outreach programs. We are very proud to be able to offer one of the very best fine arts festivals in the country. About 210 artists are selected by a jury from the 900-1,000 applications we receive each year and another 15 of our Best of Show artists return to The Woodlands to share and sell their work. Regional and local performers appear throughout the weekend to entertain the arts enthusiasts while they shop or eat and drink along the Waterway. The Arts Council currently brings multiple arts enrichment programs to each of eight Title 1 schools, including performances, field trips, enhanced arts projects, stipends for arts supplies and more. We would like to “adopt” several more schools, if we can find sponsors willing to assist. We also serve Seniors (Super Adults) and persons with special circumstances year-round. We will also be holding a free summer arts workshop at The Woodlands Mall (our Presenting Sponsor) on July 15th for 5th and 6th graders, which will be taught by TWAC Master Artist Jen Lucas and her best high school art students. Students will receive instruction at Microsoft (our Supporting Sponsor) and then proceed to the temporary art studio in the mall. Pre-registration on our website is required, as space is limited. Students will be able to take home a piece of art and contribute to a collaborative piece that will be hung in our Spotlight on the Arts Gallery in The Woodlands Mall. A large inspirational collaborative piece created at the Festival in April by Festival attendees and produced by The Woodlands Art League and Cassidy Joined for Hope now also hangs in the Gallery and spotlights the critical issue of teen suicide prevention. We will host a re-opening of the Gallery later this summer, and in September we will offer 7th and 8th graders “Fast Draw” to train for the Rodeo drawing competition. Another free fun summer activity is to tour the 14 Art Benches along The Woodlands Waterway. You can walk, bike or take the water taxi or Woodlands shuttle from The Mall to Town Green Park. More information is available on our website. We are now seeking underwriters for Phase 3 of this project, which will be extending into Hughes Landing. All art benches are maintained by The Woodlands Township. The art benches also serve as the springboard for ArtFeel, a contemporary interactive arts experience on our Facebook page. Each month we spotlight a different bench, enjoy the literary art of Nickole Kerner Bobley and ask people to share their thoughts, feelings, photos, “selfies” or videos about how that piece of art impacts them. Please join the fun on Facebook! Lastly, we support local artists and arts organizations and advocate for our common needs and interests. The Woodlands Township’s consideration of a Cultural Arts Center is an example of a project that we wholly support to provide a needed physical hub for arts in our community. A Cultural Arts Center has always been a part of the master plan for our community, and according to the latest two surveys, the residents support it. The Cultural Arts Center currently under consideration would contain mid-size and small performance and rehearsal spaces as well as potentially a non-profit gallery, exhibition and teaching spaces, digital media arts spaces and programs and a healing arts space. It would not compete with the Cynthia Woods Mitchell Pavilion, which accommodates large performances. Assuming The Woodlands Township Board approves Phase 2, the specific components would be assessed in the consultant’s feasibility study. Phase 2 addresses location, capital costs, operating expenses, likely users and partners. The feasibility study would most likely become available in early fall. Our tagline is “Because Art Matters” and we believe that art enriches individuals and communities. No great civilization has ever existed without art. By enhancing the quality of life, arts help attract and keep residents and businesses in our area. A Cultural Arts Center would spur additional retail activity including restaurants and hotels and also increase sales and hotel tax revenues. For these same reasons we support a Cultural Arts District or cultural tourism in The Woodlands. We are very excited about our future. We have recently hired our former Treasurer, community leader and business management consultant Mike Bass as our first Executive Director. Mike is assembling a staff of artistic and dedicated staff, who we are confident will allow us to more expansively meet our mission to provide regional cultural and educational enrichment opportunities that encourage, support and promote the visual and performing arts. The Board is exploring an opportunity for a 2018 fall cultural arts festival that would celebrate the diversity of our local visual artists and performers. Art fosters joy, hope, imagination, introspection and healing. Fortunately, it also offers economic benefits to our community as well. We could not provide these experiences to the community without the help of our sponsors, donors and volunteers. We encourage anyone who is interested in the arts, wishes to sponsor, donate, volunteer or become a Master Artist to visit and follow us on Facebook and TheWoodlandsArtsCouncil.org.